This is the third volume in BHRS’s series of poll books and covers the years from the fall of Walpole to the rise of William Pitt the younger. It was a period when Britain was constantly at war, when it suffered a dangerous Jacobite rebellion and when the American colonies were lost. Yet this constant warfare did not produce the revolutionary changes to the national and local economy that the Napoleonic wars subsequently created. 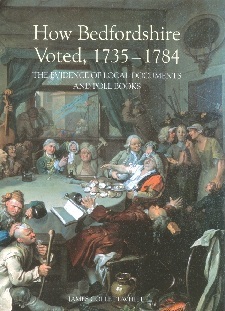 There is only one complete poll book for the county (1774) but surviving lists from Bedford borough, including a partial poll book of 1747, enable political allegiance to be gauged. Lack of contested elections does not mean an absence of political activity. Detectable trends are illustrated from the Duke of Bedford’s archives and the Hardwicke manuscripts in the British Library. They include the attempts of the Duke to increase his powers, which were successfully challenged by Bedford borough by the creation in 1769 of many new out-of-town freemen to detach it from his influence; the decline of formerly prominent political families; and, from the 1760s, the rise of the Whitbreads. The volume also details the political dimensions of the litigation over the appointment of the rector of St John’s, Bedford; the administration of the Harpur Trust; and turnpike and enclosure acts.